I was not given anything, or promised anything, in exchange for writing this post or others on this subject. I was given an invite, and I was happy to pay may way to be there. Really, it was only a 3 1/2 hour drive from home. I’m a blogger, not a journalist. But I try to get the facts as accurate as possible. If I missed something somewhere, please let me know. To find out more about others working on the Artificial Pancreas project, and what they’re working on, check out yesterday’s post. The CDT at UVA is seeking volunteers for a clinical trial of the Artificial Pancreas, to test an algorithm specifically designed for pre-menopausal women. To find out more about that, click here. The second part of last week’s visit at the Center for Diabetes Technology at the University of Virginia centered on the device itself. We were welcomed by Patrick Keith-Hynes, PhD, and Colleen Hughes-Karvetski, PhD. Both of these individuals have been at this game for some time. After founding and co-founding two technology firms, Dr. Keith-Hynes has been working since 2010 on development of the mobile device itself (more on that in a minute). Sorry about the poor quality here… I missed my chance to get a photo until it was back on the desk and hooked up. This device is an Android 3G phone. The software gets wiped off of the device, and the Artificial Pancreas platform, including the algorithm being used, is loaded on. So when you’re hooked up, you’re wearing your pump and a continuous glucose monitor, and you’re carrying the device. Right now, the device is also connected to the CGM because the latest CGM transmitters aren’t wireless-compatible with the phone yet. But… with the next generation of the Dexcom, there will be wireless capability. In the interim, they’re working on a Bluetooth solution. Why an Android phone (an actual question asked by a participant)? Because compared to the iPhone, the Android allows for a lot greater flexibility in terms of what you can and can’t include, or even block, from the phone. 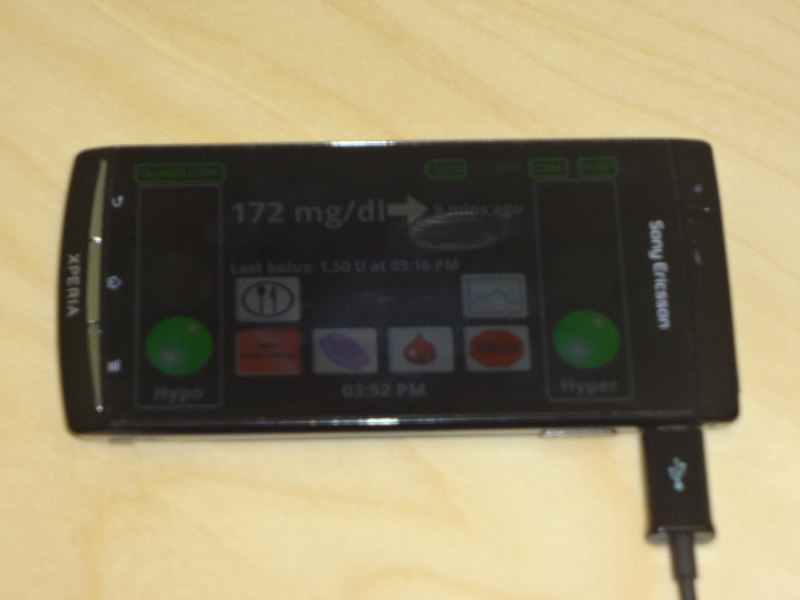 The Android as Artificial Pancreas will not allow you to load additional apps or play games or make calls. Can’t program that using the iPhone. With the Android they’ve been able to program the low glucose alarm so you can’t lower the volume. Can’t do that with the iPhone either. Would the AP still work with all of this functionality? Maybe. But it would be a lot harder to gain FDA approval. The touch screen has several buttons: One to access a graph of how your BGs are trending. One to administer a meal bolus. One to enter information when you’re about to exercise. I tried to write down what all of the buttons do (while holding the device), but I have to admit to being blinded by the technology, and I was unable to get them all down. To be honest, I caught myself imagining what my life would be like with one of these things in my pocket. While we’re at it, clinical trials are currently being run using the idex combo (Omnipod & Dexcom). And there’s testing underway with the Animas Ping, and the new t:slim pump from Tandem Diabetes Care. During the in-hotel testing I wrote about yesterday, the trial participant has all three pieces of the puzzle (pump, CGM, AP) stored in a fanny pack. In case you’re wondering, the team has come up with a plastic bag of sorts to put everything in that will allow the participant to shower. Once everything goes wireless, the participant will be far more mobile. Now, where was I? Oh, I was going to talk about remote monitoring. Since it’s a smart phone, there’s a wi-fi component. That means there’s the ability to upload real time data to the internet. Remote monitoring already helps members ofthe team check on participants during trials without actually viewing the device itself. Once the Artificial Pancreas gets approved and out to the general public, Moms will be able to monitor their kids at school, or at night from another part of the house. Endocrinologists will be able to keep close watch on their patients, though I’m not sure how comfortable I am with that idea. My spouse would be able to see how I’m doing when I’m on the road for business. A couple of additional questions that were asked: What’s the range of the device? Roughly the size of a normal room. Leave that space, and the device can’t get a glucose reading. And my favorite: When this technology becomes universal, and there’s a roomful of PWDs with their APs all on the table… how will people be able to tell which device belongs to whom? Okay, well, they’re not there yet. But it’s a nice thought. Dr. Stacey Anderson, Medical Director of the UVA Center for Diabetes Technology. She’s an endocrinologist who is clinician in charge of running Artificial Pancreas studies at UVA. 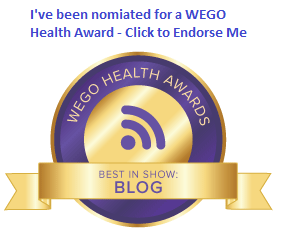 She’s also published papers evaluating the accuracy of continuous glucose monitors. Molly McElwee, RN. Molly is one of the Center’s clinical nurse trial coordinators. She coordinates inpatient and outpatient clinical trials focusing on new device technology. A T1D herself, Molly serves as a liaison between the Center for Diabetes Technology and the UVA Patent Foundation. For more information on the center and to see staff bios of the people working on this cutting-edge technology, visit the center’s website. Thanks again to the Center for Diabetes Technology at the University of Virginia for inviting me to last week’s event. If you have any questions, feel free to leave them in the comments section, or e-mail me using the link above. 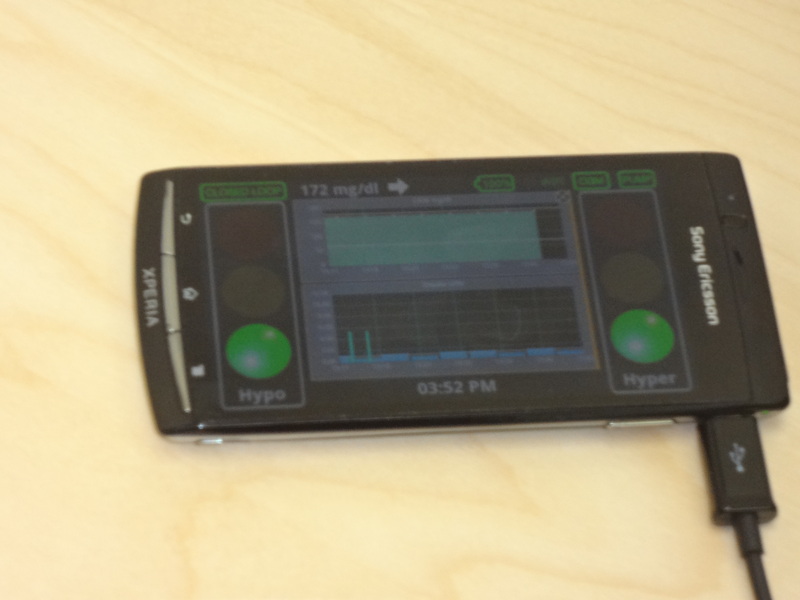 « Artificial Pancreas, part 2.